As my (not so) short tactica series rolls on, I’m taking some time out to wrap my head around how best to use Daemon units in 40k. Now that it’s finally possible to field mono god lists now that every god has units for each slot of the Force Organisation chart, certain armies are viable where as before they were not. As I’ve always been a fan of Nurgle, but have never really found Nurgle aligned daemon units to be great in anything but a defensive position, it seems the best place to start. After that I shall move onto other gods and their units, followed by the concept of having multiple god units in one list. But not Tzeentch. That guy is weird. So where else is best to start but the humble Plaguebearer? Having slightly average stats with the only standouts being Strength and Toughness 4, the cost of the unit is slightly offset by having a Plaguesword, which lets the unit wound anything on, at worst, a 4+ and glancing vehicles on rolls of 6s’. Plaguebearers, painted by Moon Dog Studios. But still, with only 1 attack and as Plagueswords have no AP, everything points to them being defensive in usage really and being able to be swept away by even average combat units like Assault Marines. They certainly won’t be killing things from afar, unless you count being ugly as a ranged attack. So how to buff them up, or is there even a need? The unit on its own is never going to be great at what it does due to its very limited additional options. But use that to your advantage. Bulk up on extra bodies to overwhelm your opponent and absorb incoming blows. Take a Plagueridden and spend the 10 points needed to surprise your opponent with some AP2 master crafted close combat attacks. Take that icon for +1 to your combat score. All in all, just over 200ish points will net you 20 Plaguebearers, the afore-mentioned champion with his stabby sword of death and a banner. But it can only do so much, which I when we need to start turning to outside forces. We’ve two options in this case, a Demonic Herald of Nurgle and Epidermis. Epidermis is pricey and his sphere of influence has been reduced since the last codex, which makes me somewhat reluctant to recommend him. Regardless though, if you can get the kills in, you suddenly have a few units with lots of extra attacks that would everything on a 2+. This leaves the Herald of Nurgle, as last time I checked, Monstrous Creatures can’t join Infantry units. Which is just as well, as a Herald can give you a great deal more flexibility that you may expect. For a start, he can start adding the attacks in with Locus of Contagion, which gives extra Strength 4 hits on rolls of 6, or else make them far more survivable against the opponent with the Locus of Fecundity (which I would always plump for regardless of use personally just for the name alone) which gives them Feel No Pain. As with the unit champion, unless you are hot with your dice, its only ever work investing a few points in your daemonic table rolls for me, as it can help him get a bigger stick of whacking, but the random nature of the rest always makes me a bit wary of spending too many points . Keep your Heralds cheap and plentiful is my motto, which is why, unless you are forgoing the use of a greater daemon, I tend to skip out on Psychic powers for them. They get pricey fast and the Biomancy powers will be replicating a lot of what you have spent points on via locus’s and deamonic table rolls anyway (or else is redundant as you will be wounding most things on a 4+ or better). The Nurgle powers are pretty good, but again, are a bit reliant on circumstance and being close enough to the enemy without them charging you first. With Slow and Purposeful, that’s always a gamble and its their biggest weakness as potent combat unit. Still, if you can get a large unit and can get a few enemy units too engage them whilst Miasma of Pestulance is cast, well, its time to have some fun. Most Nurgle units may even go first in combat for once! Now lets move onto probably is the best use of Plaguebearers, which is that of a support unit. Like Dark Eldar Wracks, these guys are begging to be hunkered down in cover, especially as they come with Shrouded as standard. If you want to stick a Herald on them with Locus of Fecundity, then all the better! 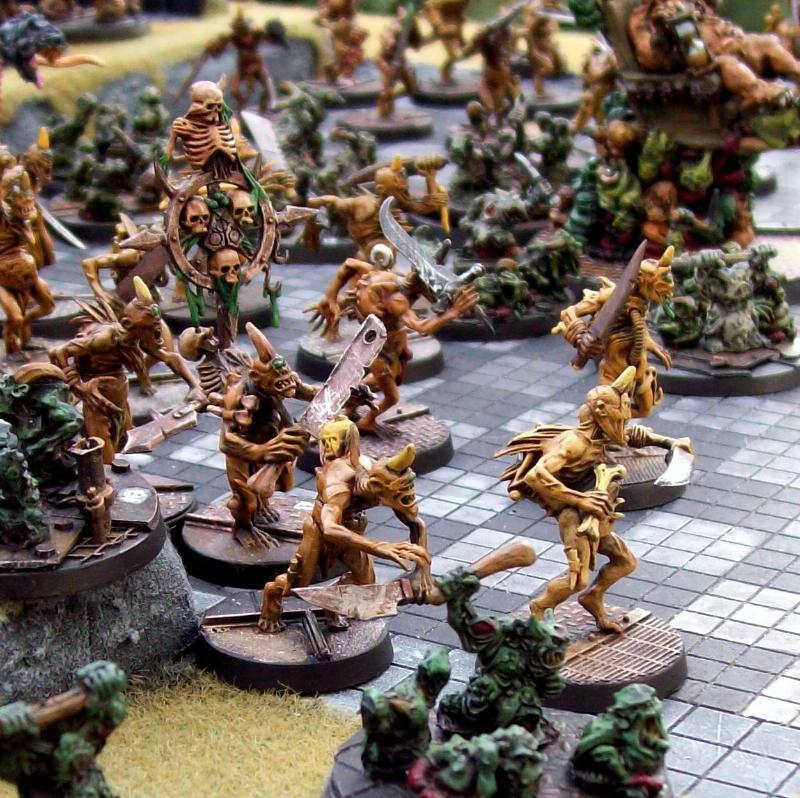 In this scenario, Plaguebearers, as well as being objective claimers, act as ways of getting your more devastating units onto the board without a scratch on them. In a mono Nurgle force, this means pretty much every single unit bar Nurglings.Take a banner and an instrument to help with getting units onto the board fast and hug that cover! With Toughness 4, Feel No Pain and a cover save on them, they should be pretty hard to kill unless significant time is spent on killing them. At the end of the day you are Slow and Purposeful anyway, so it’s not as if you will be needing to rush up the board. Perhaps Deep Strike a few more units up the board if you feel adventurous for extra pull. The Nurgle psychic powers will start coming into their own too, as you can be counting on units coming to them rather than the other way around. In the end, Plaguebearers can be used offensively in a pinch, but all the points spent on them would be better equipping them to play a little more conservatively, whilst your more hard-hitting units do the work of killing things. A units of 20 is still nothing to be sniffed at though, and in games in excess of 2000 points, its worth having at least one to counter attack units that get too close to anything important. You can get Plaguebearers from Firestorm Games, priced £16.20.